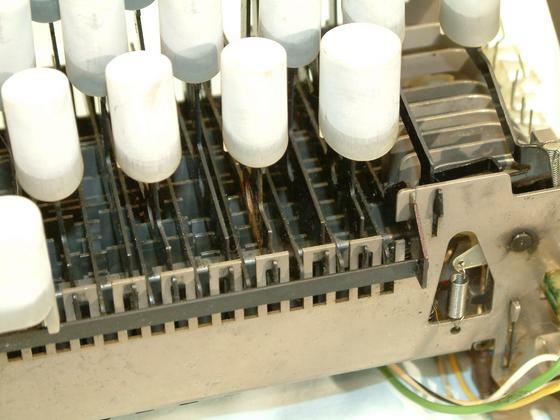 This is a closeup of the top of the ASR 33 Teletype keyboard with the cover removed. Each key is on a bar which presses down on the codebars. The codebars are in pairs with one of them having a part that sticks up which will set the codebar to the correct state for that key. After the key is pressed they are locked until the cycle finishes to prevent more than one key from being pressed. At the end of the codebars are the left ( 42K) and right ( 49K) contacts which convert the codebar motion to the ones and zeros to send.